A stylish place to stay: the Boutique Hotel Haus am Zoo in Dusseldorf. Dusseltal is an exclusive residential area. 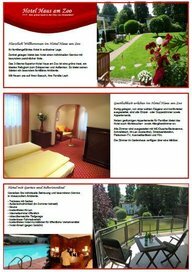 There you will find a stylish place to stay - the Boutique Hotel Haus am Zoo. Embedded in a British like ambiente, guests have the choice between the modern main house and a unique cottage. Altogether 10 single and 11 double rooms, one Junior Suite and family rooms. Like a green island, the 3 star superior stylish Boutique Hotel Haus am Zoo in Dusseldorf is used as the perfect recreation place. It is famous for uniqueness and privacy, and for it’s excellent service. Guests receive gratuitous tickets for all public transport which can be used for the whole area of Dusseldorf.